France face Netherlands in an international friendly fixture in Amsterdam on Friday night, a match between two European giants. This article contains our NETHERLANDS v FRANCE betting preview with free predictions, tips, best odds, lineups, streaming links, bookie promotions and no deposit free bets on the match! Netherlands failed to qualify for Euro 2016 after a dismal campaign saw then finish fourth in Group A behind the Czech Republic, Iceland and Turkey. Since the end of the qualifying campaign, the Dutch team played just one friendly and they beat Wales 3-2 with Arjen Robben scoring the winner in the 81st minute. 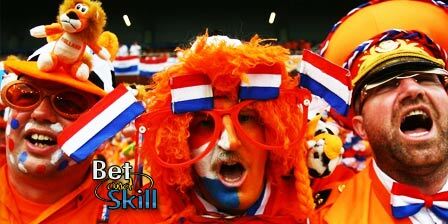 The Oranje are very vulnerable at back and have conceded 10 goals in their last five outings. Holland are still in their rebuilding phase and the head-coach will take this as an opportunity to tinker with his tactics and line-up. Robben misses with a thigh problem he picked up in the Champions League against Juventus. Gregory van der Wiel and Maarten Stekelenburg have also been left out as well as Robin Van Persie who continues to struggle with Fenerbahce. Furthermore, full-back Erik Pieters has been withdrawn from the squad. France, the host nation of the Euro 2016, are W10-D2-L4 through 16 friendlies since the World Cup. Didier Deschamps’ side have won five of their last six matches and look like a strong contender to challenge for the tournament in the home soil. They suffered a 2-0 defeat away to England last time out. Les Blues have managed only 3 wins in their last 7 outings. With Karim Benzema still suspended, Arsenal striker Olivier Giroud is expected to start up front, with Andre Pierre Gignac ready to play in the 2nd half. Steve Mandanda and Hugo Lloris are in contention for a place in goal, while N’Golo Kante is in line for his first cap. Dimitri Payet, who has been impressive with West Ham in the Premier League is also certain to start. Netherlands (4-2-3-1): Cillessen – Willems, van Dijk, Bruma, Karsdorp – Blind, Sneijder – Wijnaldum, Afellay, Depay – de Jong. France (4-2-3-1): Lloris – Sagna, Varane, Koscielny, Digne – Pogba, Kante – Payet, Griezmann, Martial – Giroud. "Netherlands v France predictions, betting tips, odds and lineups (International Friendly - 25.3.2016)"